Hi Pepper Pomeroy here. I run a proposal planning business. If you haven't heard of this trend, let me clue you in. Today many couples live together for a few years before they become engaged. 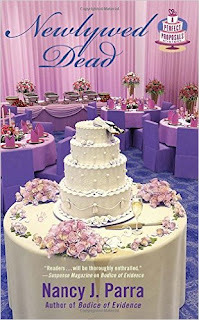 The engagement is sort of expected, so in order to make it super special many couples will plan huge surprise parties. I help couples plan the proposal and then immediately after the couples family and friends have an engagement party. The bigger the party the more fun the engagement. My favorite this time is a proposal set in a giant toy story amid toy soldiers. In this case it is the girl who proposed to her man and let him know that she was pregnant with their baby. Christmas in a toy store is a lot of fun to use as a theme for a party. Unfortunately during my sister Felicity's wedding reception one of the bartenders ends up dead. I want to keep Felicity from finding out and so I work to solve the murder before Felicity comes home from her honeymoon. It takes me deep into Chicago society and I learn that money can't buy everything. Have you ever been part of a proposal party? Or given an engagement party? If so do you have a favorite theme? As a planner I'm always looking for new ideas. Newlywed Dead is out NOW! Get your copy and let me know if you think I did a good job with my themes this time. Congratulations on your newest release Nancy!